Sometimes you need a little challenge to get your creative juices flowing. A few weeks ago, I was in the midst of redoing my kids’ bathroom (still working on it, too! ), and I was having one of those days where everything just felt blah and boring. I couldn’t shake the feeling that I needed to take a little time off to focus on something different. So, Emma and I hopped in the truck and went to Home Depot, where we walked the aisles looking for inspiration. I Instagrammed (is that a verb now?) this image from the parking lot. I’m sure those of you who follow me thought that I had really fallen off my rocker this time. In fact, I only got a few likes because y’all were so scared. That’s okay. I wasn’t. I took my cheesy rug home and almost immediately decided to cut it up into pieces. My first thought was to cut it into strips and do a modern looking treatment on my concrete slab patio (which may still happen), but then I realized that a little alcove in my entry way was calling my name. 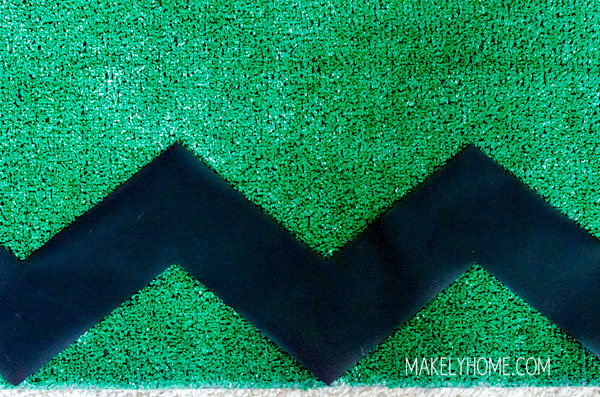 I cut out a vinyl zig zag on my Silhouette and used it as a template to cut strips of a chevron stripe from the rug. The rug sheds slightly, but I was really surprised at how well it held up to beng cut. I only cut three strips since they were going to go behind my antique sideboard. Any more would have been a waste of time, since they wouldn’t really be able to be seen. And now I still have about 3/4 of the rug left for a future project. To hang on my wall, I tapped a small finishing nail in each point of the chevron with my hammer. I used a ruler and level to get the spacing as close to straight as I could. The end result is really cool, if I do say so myself. That bright green is one of my favorite colors in the world. And even more, it created a quick, cheap feature wall that I can remove in about five minutes when I’m ready. My kind of project! 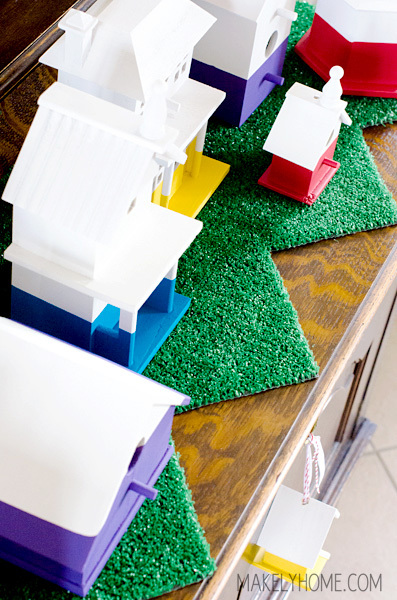 I even repeated the zig zag edge on the artificial grass runner that I laid underneath my dipped paint birdhouses. I think it’s an unexpected thing to use as a table runner and really makes the bright colors pop. I think it would be so cute on a table for an outdoor party, too. Maybe I’ll do something cute like that for the neighborhood party we are planning in a few weeks! What do you think? Does this give you any ideas for an unexpected wall treatment? Haha, love this. Such a cool idea. I actually stood in front of a grass shag rug last week and was wondering where I could put it in my home. This is certainly an idea! 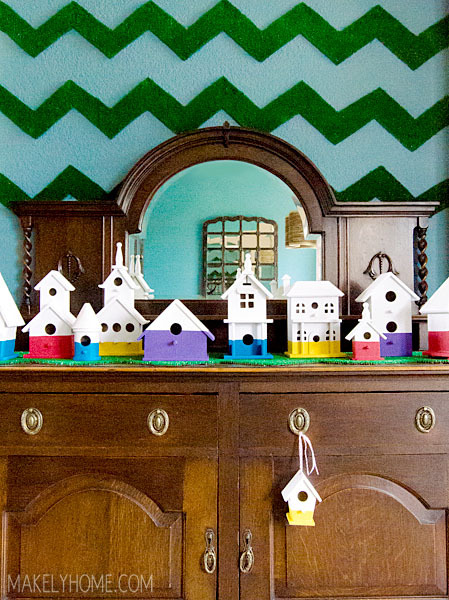 I was excitedly waiting for this post after the sneak peek you gave with your dipped birdhouses (which I love, by the way). Astro turf on the wall? Yes! Such a fun twist on the standard chevron design, Lindsay. I would love to see your home in person–your creative style is awesome! How fun is that! Love it. 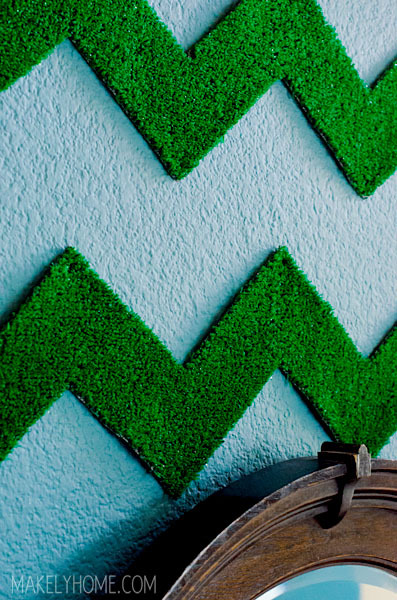 My husband would be so scared of me if I told him I was putting astroturf on the wall! This made me smile, Lindsay! I’ve been ‘playing’ with artificial turf a little lately myself. Love it on the wall for something fun and unexpected. This is such a great idea!!! I’m obsessed. I was looking for a way to brighten up the hallway leading up to our apartment and this is a great way to do it! You totally gave me some ideas! 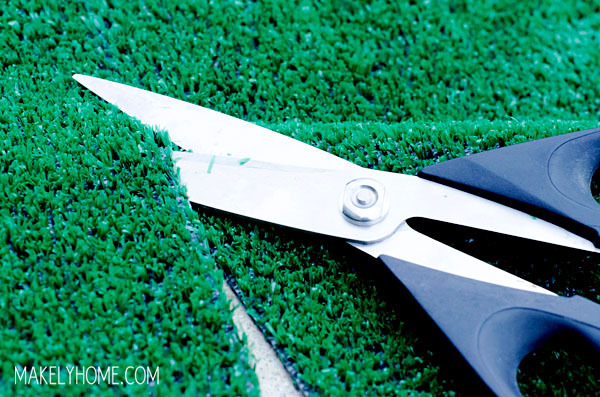 I’m looking for ways to spruce up my patio and a bare brick wall out there, so the idea of cutting up turf is totally fun! I can’t wait to spend time on this one and I’ll share my final piece with you when it’s done. Oh, also happy to know others walk the aisles of Home Depot, too, just for inspiration. Yup, that’ll do it. You have my apapocirtien.